This article gives a simple overview of all the GIANT figures ever made. This for easy identification. Many people grew up with the GIANT soldiers, most of them not even aware of the fact that they were figures produced in Hong Kong. My first soldiers were also GIANT style cowboys & Indians! The GIANT soldiers were really 'playing' toys. The quality was not that good and they came in colours attractive to children. Most had a short life span because of that. Now they are collector items. Herbert and Harold Rosenberg started the Rosenberg Toy Company in 1947. 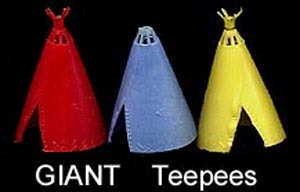 But it was only in 1960 that they changed the name into 'GIANT plastics'. It is to be believed that it was named after the NY Giants football team. In the same year the Rosenberg family made a trip to Hong-Kong, bought some property there and started to manufacture toys, and thus indeed started to produce the now so famous 1:72 figures. The local company in Hong Kong was called 'ARCO'. It is no longer known which sets are produced in which years or in what order. But the true GIANT figures were all produced between 1960 and +/- 1970. After that the figures were still on the market, but not marked any longer as 'GIANT”. Copies of GIANT knights for example were sold all the way up to 1993 (Knights type I, see below). The name GIANT was changed into ARCO at the end of the 1970ties. Most of the small figures were piracies or copies of figures made by established manufacturers in that period. Although in this case they were of course scaled down to 1:72. The figures were sold in the US and in the EU, although we think much more in first then the last when looking at Ebay sales. Much more figures are still showing up in the US nowadays. So what else do we know about the GIANT figures? Well, quit a lot nowadays. That's the reason I decided to write this article; to combine all info and to give all collectors good access to the correct info. And first of all to show a line-up of all the GIANT figures. Something never done before. Basically this article is based on 5 sources, and we should accredit these sources because the persons behind did a real great job in starting to order the things. I specially like to thank Kent Sprecher and Victor Rudik for co-reading this article and supply me with additional pictures. 'Giant or what ? 'Articles in the 'one inch warrior nr 2,3,4,5,6,8,9,10', written by Hugh Walter. 'Giant, obscure in more than one way'. Article in Plastic warrior nr 36, written by Jan Boers. 'The Story of Giant Toys'. Article for Playset Magazine (still to be published). Written by Kent Sprecher. I also used Kents' website (Toy Soldier HQ). 'The One Inch Army book, 2nd edition'. Book written by Victor Rudik. Nevertheless all these sources only un-cover bits and pieces of the giant GIANT mystery. Time to be more complete. And what about all these copies of GIANT? Eh, well yes, that makes this article a bit complicated. Many soldiers originally marked 'GIANT” were in turn copied (for example by MPC, L&G, Woolbro/Woolworths, W.H Cornelius, or Toy House) or perhaps only simply reproduced under different names by the same company. This article does not intend to list all copies, but just focus on GIANT itself, with some small side steps. 'Made in Hong-Kong', 'Made in H.K. ', no marking of what so ever, or simply 'H.K., all can be found (and more). But lucky enough not all GIANT figures have that problem. This is mostly the problem with the Cowboys & Indians and the knights. The Cowboys & Indians are covered in Arlin Tawzers' fantastic article and we thus only discuss the original figures here (that saves me a lot of work). The knights in all the different versions are nevertheless listed in this article. And then we have some set's that are 99% sure to be made by GIANT (same sculpting, bright plastics and sizes) but are not marked as such. I take no risk, and just include them below. Better a bit more figures on display then none at all. And probably I am not even complete in this article, but feel free to send your remarks and I will adjust accordingly. I will not write too much about the packaging but only give a brief summary. All soldiers came in small plastic bags with a cardboard header (so called 'header bags'), or in blister packages. They came in endless variations, depending if it's was GIANT or something else. Sometimes they came in play sets with guns, vehicles or boats. I will cover all these 'extras' as far as I know them, so that you can recognize them. 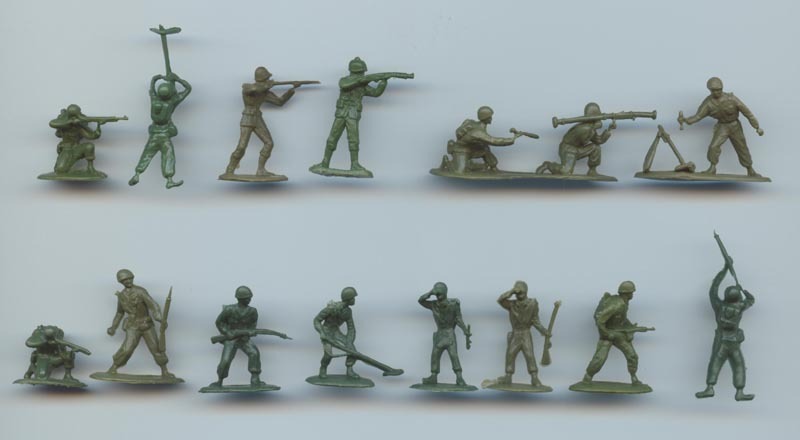 Many soldiers were also included in the games of 'Helen of Toys' (The company was also advertising, amongst others, as 'Lucky Toys', 'Bi-A-Toy Corp' and 'Five star Toys'. Details can be found in the table below. I will discuss the figures by time period, starting with the Mongols and finishing with Space aliens. But first I will put all the details in one table. This for easy reference. The column 'rare' indicates when the figures are easy to find (1) or not at all (5). When easy to find the figures can be obtained for low prices; when extremely rare to find (5) you will need to think twice about whether you are willing to obtain them! Comes with ship. Also in 'Viking Attack play set' made by Bi-A-Toy. 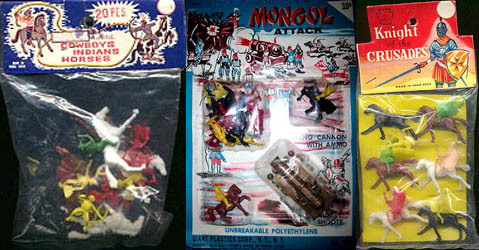 The Mongols invaded toy soldiers land with 12 foot and 6 horse poses, in red and yellow. The sculpting quality is not that good when compared to other sets. They often came with the 1st Type knights, which are of the same quality (see number 9 & 10 below). The Mongols almost always came with a palace and a huge gun (the gun came in 2 versions, there was also one with a small wing type aiming device on top of the barrel). The 'palace' was basically the same as the knights castle, only the front/entrance section and the roofing was different (more oriental) and the banners on the towers (a pennant with the knights, and a saw-tooth banner with the Mongols). See picture with the two types of buildings. The Mongols sometimes came with the 'Shogun's palace'. The was to be placed inside the castle. See picture. The knights (type II, see below) sometimes came with a 'castle keep'. The figures are quite easy to obtain as BUM did somehow re-issue them as their sets 180 and 181. The Shogun's palace and the big gun is rare. The original Romans (picture 1 and 2) appeared in 3 horse and 6 infantry poses and for the first time in 1959. 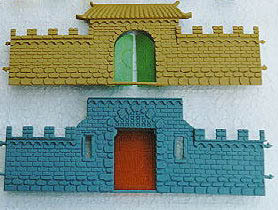 The Romans that were included in the Helen of Toys play set 'Roman soldiers' were flats (2 dimension). It is not known if the above 3D figures were ever used in a game. Later these figures were re-issued by Baravelli, as their numbers 50468 and 50469. These Romans were sold as 'Romans' but are actually Greeks. They are copies of the early Marx 60 mm Romans (who could also be used as Greeks) and of the Herald 54 mm Trojans. The Romans came in red, green, yellow, silver, gold, brown and bronze. Many soldiers came with a tiny hole in the base to put them on a peg on the baseplate of the chariots. 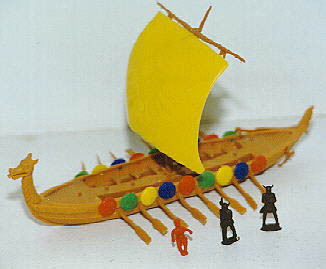 The Vikings always came with their longboat (see picture earlier in this article, the ship is a copy of the Aurora model). Another interesting fact is that the horse soldiers are simply copies of the foot warriors; only mounted on different legs. This is something GIANT was doing more often. The mounted figures are very difficult to get. All the figures are scaled down copies of the Aurora 25/27 mm figures. They came in red, yellow, blue and brown. The last picture shows the boat-crew. The first figure is a rower/oarsman (the picture is vague because I do not have the figure and was thus creative with a computer program). These oarsmen are very rare, as many or most packages didn't even include them. The second figure does the steering, the third is the commander and the 4th? I am not sure, perhaps walking guard? 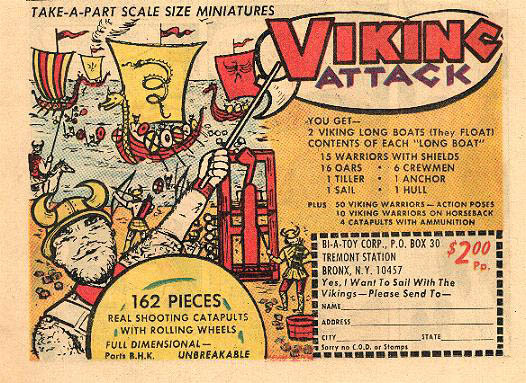 The Vikings also came with the 'Viking Attack play set", made by Bi-A-Toy. To make it complicated right away. What is commonly known in the collectors world as 'type I' knights were actually produced after the type II and III knights. But as the production timing is not that important, and we now all use this (not) logical order we keep it that way. Thus there are 12 foot and 6 horse poses. The quality of these figures is not that good, when compared to other sets. The figures are still easy to find as it seems there are still many around. The copies above are painted, but these all came in black and silver plastic (like the first pose) and marked with a P in a circle (for Patented; many GIANT figures were copied by other Hong Kong factories by the time these knights saw the light). And thus never in the bright colour plastics. 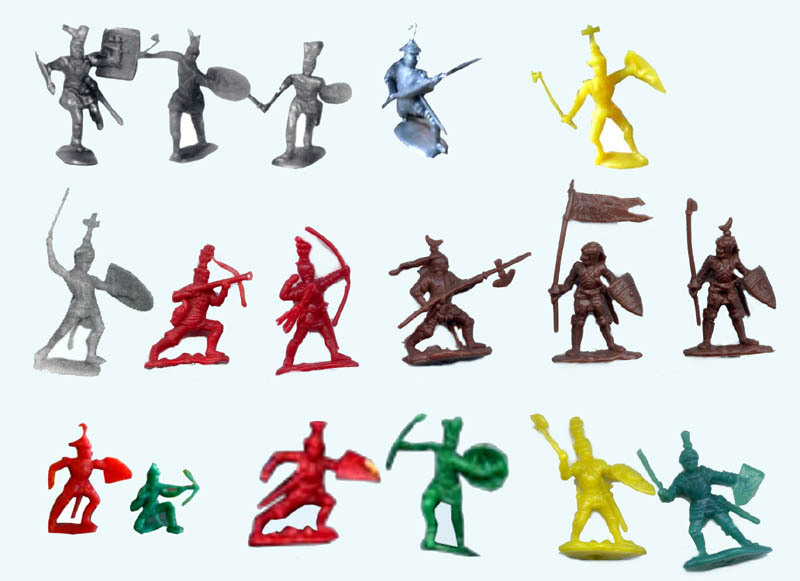 The figures can also be found, together with the type II warriors, in the Helen of Toys 'Gold crown' game (1974). The knights often came with their own castle. See picture with the Mongols above. A siege tower and balista could also be found (see picture with the Romans). Sometimes they also came with the Roman chariot (see Romans). Type I knights are crudely based on the Crescent 54 mm knights (the ones that came with cereals). These are thus the 12 foot poses of the type II knights. As explained, these were probably the first knights GIANT ever produced. But in anyway before the type I knights. I included the silver figure in the first picture to show that, even within type II, there were small differences. Compare the silver figure with the dark blue one and find the differences. Pose 2 and 7 might be similar. Perhaps pose 2 doesn't have its weapon well moulded. But in that case we miss 1 other pose as GIANT mostly made their sets with 3, 6 or 12 figures. The 6 noblemen on horse are very difficult to find. 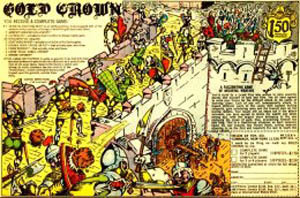 Similar to the type I knights these were also included in the Helen of Toys 'Gold crown' game (1974). Type II knights are based on Britains Swoppets, Crescent and Elastolin figures and done in; red, blue, silver, green and yellow. They were also copied by Baravelli. Interesting to point out is that the first 3 poses, and the green one on the bottom row, might as well be Vikings type II, as they do not really look like knights. All the other 12 could be indeed knights type III. The brown standard bearers without the flag seems to be a moulding problem, but I have included him because I came across the same 'problem' many more times with this pose. 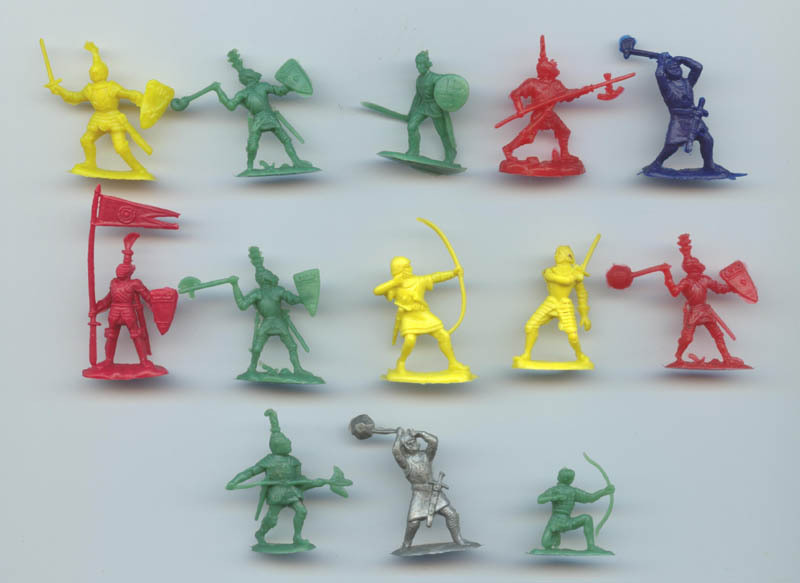 The second pose on the last row (green pose) is a kneeling crossbow man. There seems to be six horse poses around. 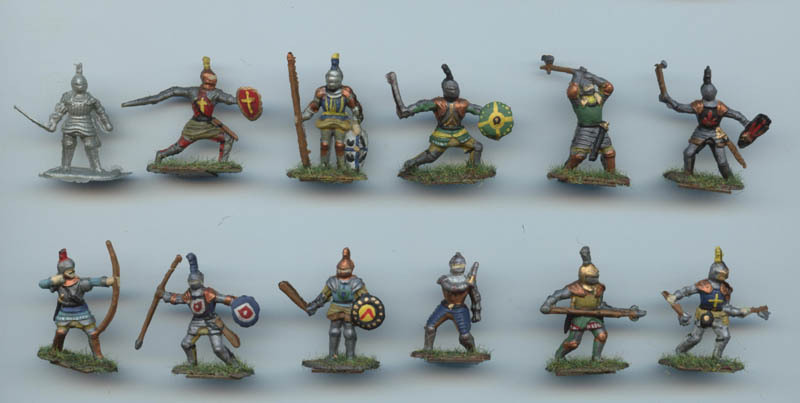 These are 'oriental' knights and some are even looking like Vikings or Saxons again (3rd and 6th pose). Type III knights were probably also produced before the Type I knights. Type III knights are based on Britains Swoppets and Elastolin figures. Anybody who has more info, please make yourself known. Thanks to Arlin Tawzer I have an easy job here. We only show the Type I cowboys, those that are real GIANTs. With 6 foot and 4 horse poses they were the start of many copies and sub-sets. They appeared for the first time in 1959. Personally I think that there were 3 horse poses first and that pose 1 was later added (following the GIANT system of 3 or 6 poses). But we will never know for sure. Thus the 1st pose is not a real GIANT figure, but 'Hong Kong' or something similar. These figure are not that difficult to get. They were never included in games or other play sets. Cowboys are copies of Crescent, Britains Herald and Britains Swoppet. Cowboys and Indians came in many cases with 'Fort Cheyenne' and sometimes with tepees, one horse small wagons (see 20), fences and crude trees. 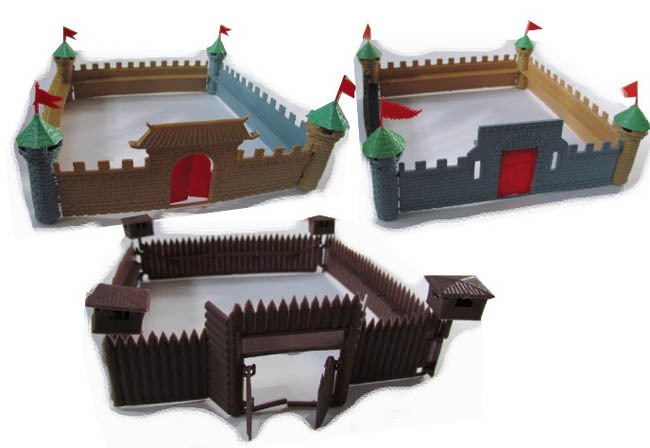 Fort Cheyenne (see picture with Mongols) came in 2 versions; the original one and a scaled down version without the towers (much more out of scale). The same as with the cowboys I have an easy job here. These Indians came in 6 foot and 4 horse poses, of which the last one was added later. Thus the 4th pose is not a real GIANT figure, but 'Hong Kong' or something similar. They appeared for the first time in 1959. These figure are not that difficult to get. They were included in the 'Daniel Boone' comic book game produced by 'Bi-A-Toy corp'. Indians are copies of Crescent, Britains Herald and Britains Swoppet. See for accessories the pictures with the cowboys. This is a bit of a strange set. 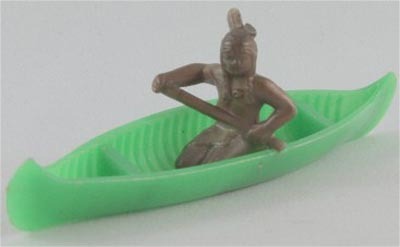 The canoe came with one figure in a set called "Canoe Race". It included 3 Indians in 3 canoes, but the figures are in 30mm ! As far as I know the only 30 mm figures GIANT made. The pioneers I find one of the best sets made. The poses are good and the sculpting was fine. They are difficult to get and some of the horse poses even almost impossible to find. The pioneers are special and they came also in GIANT like header packages, but a complete package is extremely rare. They came also with the 'Daniel Boone' comic book game produced by 'Bi-A-Toy corp'. Included in the game were also Indians and some wagons (see 20 below). Note that the horse poses 3 and 5 are looking the same but this is not the case. The red figure is holding a knife. These figures are probably scaled down copies of other soldiers, but I do not know which at this moment. They came in red, blue, green, yellow and brown. We have to discuss some accessories here because something has to be clarified. GIANT made many wagons (at least 4 marked 'GIANT', see below in picture) and these can be recognized by the horses in most cases. They used normal GIANT horses. 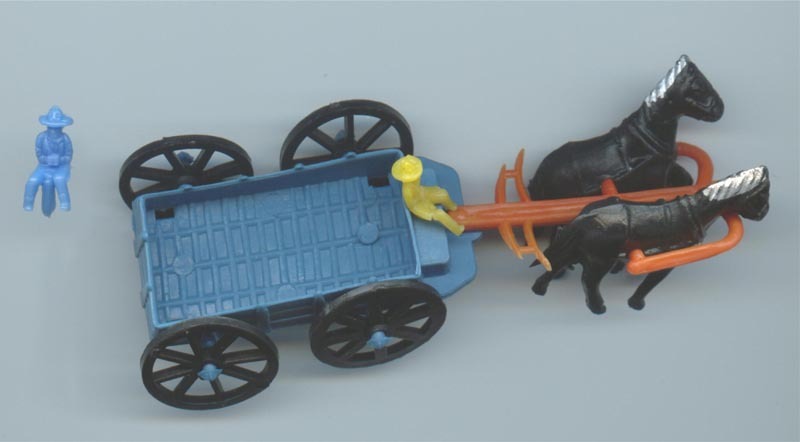 The Lido company (a famous toy company in history) also sold wagons. And also 'Multiple Toymakers' sold wagons. But these had different horses. See picture below with GIANT on left and Lido at right. Personally I think they all came from the GIANT factory as colours and wheels were the same. More horse teams could be added to make 4 horse wagons. The small DRIVER below is a bit of a mystery. It seems that he never appeared in GIANT packages, but he is often sold in second hand lots with GIANT wagons. But who knows? For the moment I regard him to be produced in the GIANT factory but sold in 'Hong Kong' or LIDO sets. There are two more drivers, although I have never seen them with the GIANT wagons. One you will find below, the other is only rumoured to exists; it's a driver with a whip. Anyone has a picture? This is one of those sets that is not marked GIANT but when looking at it, it seems that they are from the same factory. 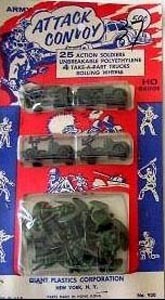 They came in bright blue and red and were only included in the Helen of Toys/Lucky products play set 'Revolutionary war soldiers". And as Helen of Toys only used GIANT figures for ALL their games and products these should be GIANTS as well, although perhaps not stated as such. 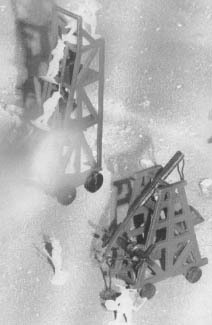 One other piece of evidence for this is that the same cannon appears also with the ACW soldiers and sets (see 22). These figures are not that difficult to get. 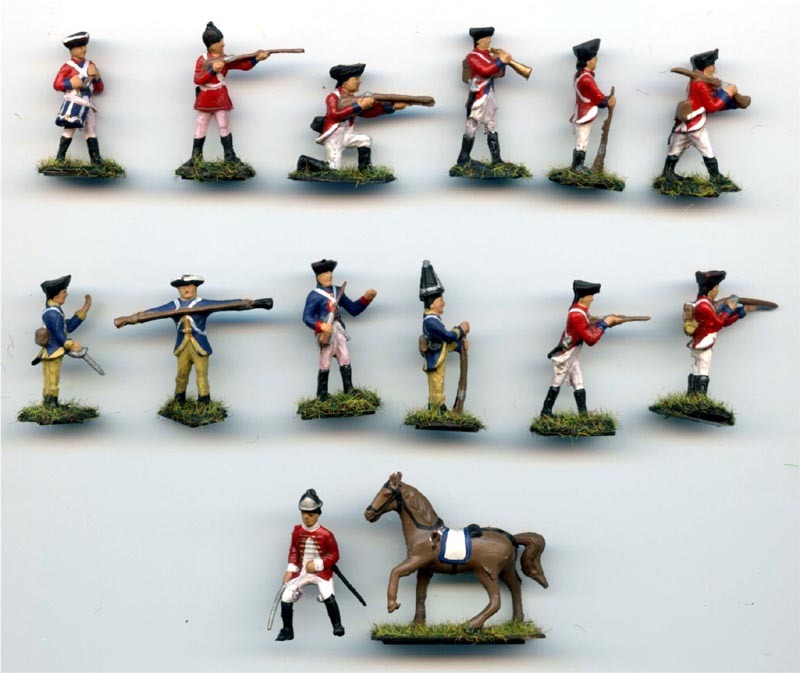 The 12 infantry poses (standard nr of poses with GIANT) are in fact 11 infantry and 1 artillery; the 2nd figure on the 2nd row is loading the cannon. There was only 1 cavalry pose available. And the horse is not of GIANT style, which is strange. So, perhaps not found in GIANT packages, they seem to come from the same factory. The Napoleonic armies were raised in blue and red colours (but also in yellow and brown!). In the regular 6 foot and 3 horse poses. They appeared for the first time in 1963. In the US these were also sold in sets named 'the war of 1812”. It is also rumoured that they were sold as 'Alamo' sets. Which could be real when looking at the first (and 2nd) cavalry pose, which is in fact a Mexican presidential lancer! Painted they look fine, but the sculpting is not that good and the uniforms are strange. These figures are easy to get. I believe they were not included in any game. The figures are copies of 30 mm solid lead figures from SAE (Swedish African Engineers) and Marx figures. The Napoleonics sometimes came with cannon and limber. See picture. 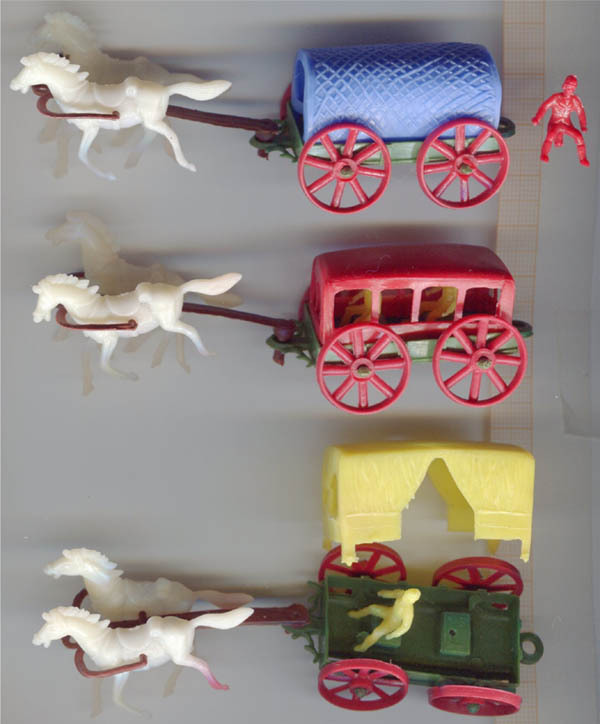 The same wagons and guns were also used for the ACW sets. The American Civil War figures came in an unusual 9 foot and 6 horse poses in blue and grey. They appeared for the first time in 1963. Like the Vikings the horse figures were copies of the foot figures, but mounted on different legs. The infantry is easy to find, the horse poses are very difficult to find in a complete set with all 6 poses. The figures were also included in the Helen of Toys/Lucky products game 'Cannon Ball ". 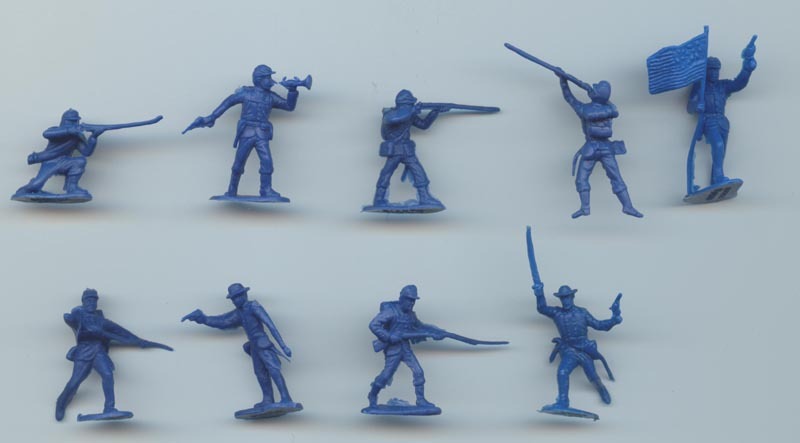 Do not confuse these with the ACW play sets where 'flats' were included (and thus not the ones above but different soldiers in 2D). 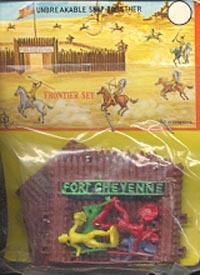 The game included the western Cheyenne fort (see cowboys and Indians), cannons and other small things. These figures are copies of Marx originals. In other sets the limber and cannon were included as shown with the Napoleonics. 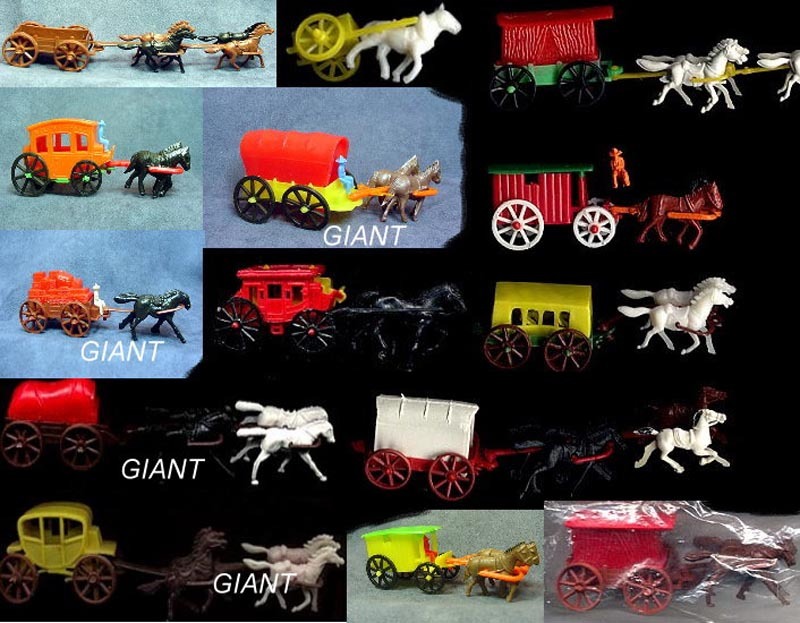 The horse drawn fire wagons were included randomly in GIANT western packages. In these packages usually 4 wagons appeared, and sometimes the fire wagons were included. Thus it seems there were 2 different wagons, each with 4 figures. The figures came only in 2 different poses as can be seen on the pictures. After the ACW figures it was time for more modern figures. WWII was an obvious choice. Let's start with the Germans. 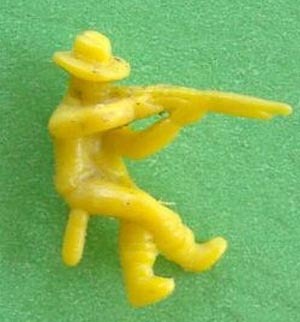 The Germans invaded toy soldier land with an unusual 10 poses. 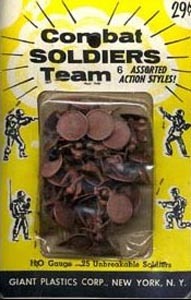 These were also included in Lucky Products play set 'WWII US/German armies'. The figures are not difficult to find. They are copies of Marx. They were also sold in play-sets with many extras. The extras came in either grey or green, depending on the army. The picture shows the complete assortment of accessories. 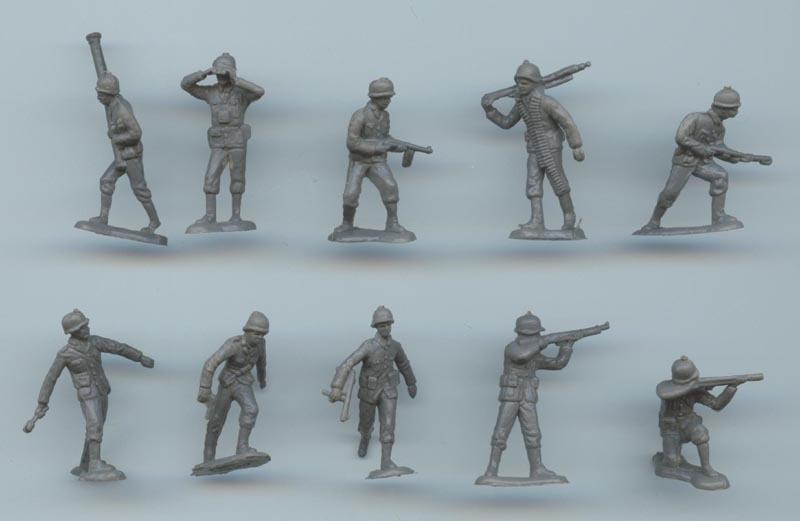 These 'round base' figures are the first US infantry from GIANT. Later they were copied and only marked 'Hong Kong'. There are 6 poses, indicating that they came indeed from the same GIANT factory. Further evidence for this are the packages that included these figures; showing 'GIANT' as the manufacturer. The figures came with accessories that were NOT the same as with type II below. They came with 4 small trucks. See picture. These figures are copies of Herald and Crescent. 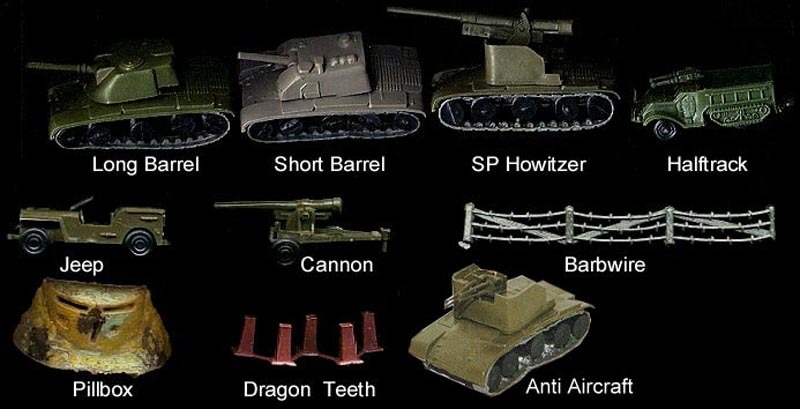 The second type US army came with the same accessories as the Germans. Altogether there are 12 poses, when counting the double bazooka team as 2 figures. There were at least 2 versions made. The picture shows some version 1 (olive green, pose nr 3 for example) and their followers of version 2 (the 4th pose). Same with pose 1 of the first row and pose 1 of the second row (version 2). 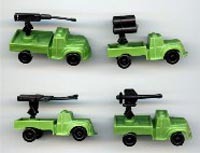 The soldiers were included in the Helen of Toys ´Tank trap´ & ´Woods Edge` games. The figures are copies of Eldon Marines and Monogram G.I.s. They are not difficult to get. They are sometimes found in grey colour as well, marked GIANT. The US infantry was supported by LCVP landing crafts. This boat included machine guns and 3 figures in 2 poses; one operating a steering wheel, the other the machine gun. It is a bit difficult to find the figures and the boat as a complete set. The figures came in two versions; with small and with larger bases. The boat also came in a green colour. 9 different Space knights were conquering other planets in the GIANT time. They came in silver as above or in gold. I do not know if they are copies from others. In later Hong Kong copies an extra pose suddenly appeared. I have never came across this pose in GIANT sets, but who knows? Picture above; on the left a figure with a medical kit. On the right the normal GIANT pose. 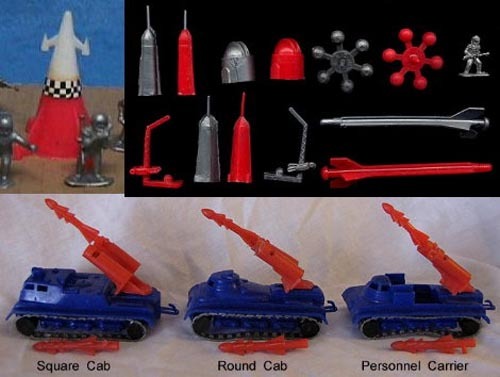 These heroes came with a missile launcher in 3 various forms and other equipment and were also included in the Helen of Toys game 'Blast off' (1963). 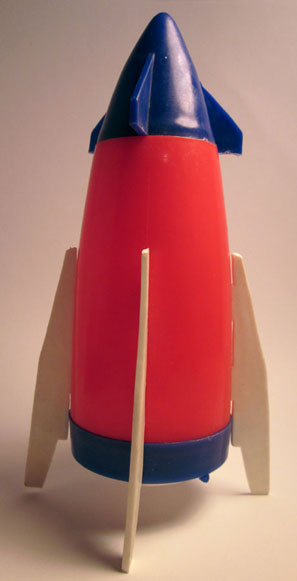 The conical rocket on the left-top in the picture below is from LP, later Multiple Toymakers. 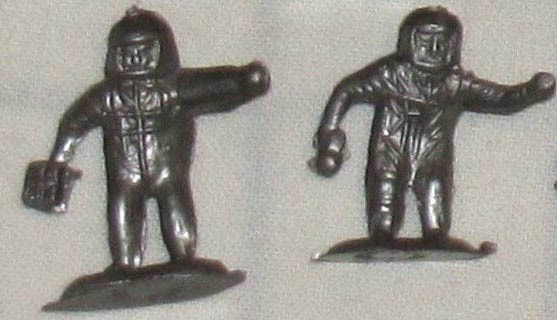 The figures sometimes came with a 'spaceship' in two different versions - see pictures below. The figures are not that difficult to find. The space knights were fighting Aliens and they came in the following unexpected wave. There are 6 poses. I think these are original poses and not copies of anything. I do not think they were ever included in any games. I never did see an actual complete package with these figures. You perhaps? To find a complete set of these aliens is very difficult. These creatures came in purple/pink, brown and green. The were flying in, in UFO's as can be seen on the picture. GIANT did not only make figures. They produced many different toys like small cars, 4-set mini planes, boat sets (at least 4 different ones), aircraft carrier and bigger toys like cars, cowboy guns etc etc. I will not include them here, as this article is about figures. And then we have the section 'GIANT or not?” Some sources say that the following are also GIANT, but perhaps not marked as such. But with each set there is enough evidence that proofs that they are NOT GIANT. We list them below only briefly. The idea is to include all these sets later on, in a 'Hong-Kong/ China' article in a more detailed way. WWI Biplane with pilot and rear gunner in red, blue, green and yellow. The figures are separate plug-in torsos. Still looking for pictures of the figures. Marked 'Hong Kong'. The palace guard. In red and blue Swoppet style. Many say that these are GIANTS as well, but they are not. This set was made by Lucky Clover, Multiple Toymakers and a few other manufacturers. British soldiers WWII. Soldiers with berets (copies of Crescent dessert infantry). They are not GIANT. Germans, US, British Australian WWII soldiers (8 different sets in total), sold in the 80/90ties in blisterpacks. Not GIANT, all produced in China. Romans. The Elastolin copies. They are not GIANT. Thanks for reading. And if you have any remarks or more information, just send me an email.